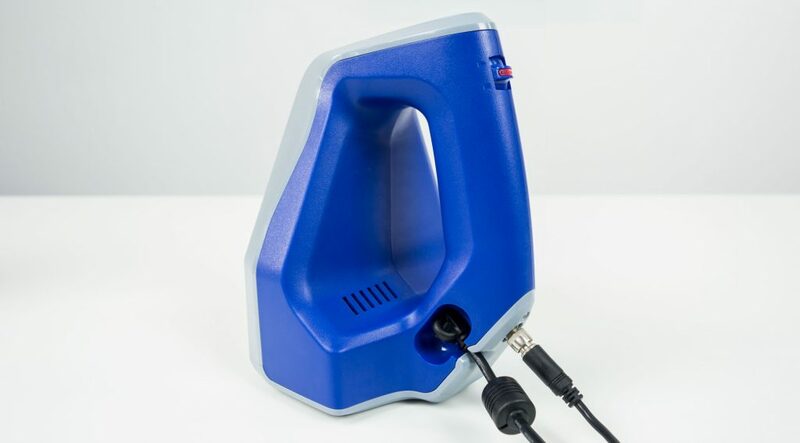 Handheld 3D Scanners are great for medium to large objects (anything from a pluche toy to a vehicle). They offer the flexibility to walk around an object with a laptop to scan from every angle at a resolution that is enough to capture the details most people need at this scale. 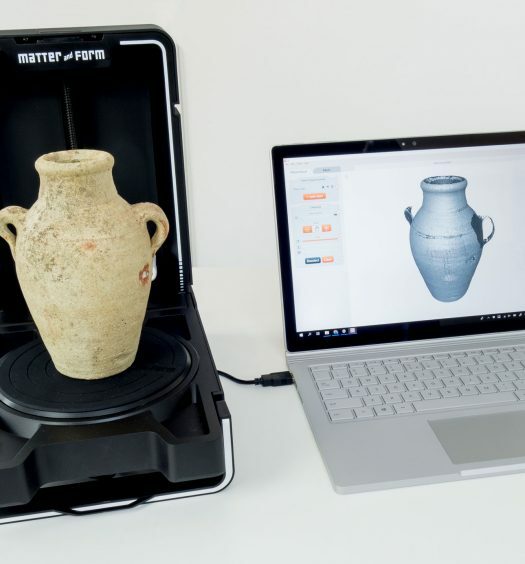 Desktop 3D Scanners are best suited for small to medium objects and usually come with a tripod and electric turntable. Their stationary nature allows for longer single-scan times to capture fine details. I already reviewed the Artec Eva, the company’s all-round handheld scanner. At €13.700 (or half of that amount for the Eva Lite if you don’t need color capture and tracking) it’s not the cheapest scanner around but if you have the budget the excellent combination of hardware and software makes this scanner a great investment. 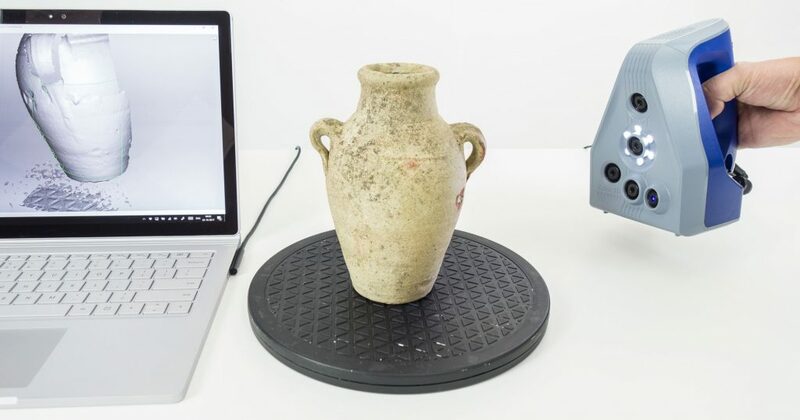 But Artec currently also sells a second scanner (soon also a third, wireless one) aimed at making high-resolution scans small objects or small parts of larger objects – and it’s not a desktop 3D scanner. It’s called the Space Spider and it’s a handheld scanner like the Eva. It’s just as easy to use and uses the same software. You can actually use both an Eva and a Space Spider in a single project. Before I go into the details of this device let’s get the price out of the way: it’s €19.700 and there’s no Lite version like the Eva. So it’s not for everyone. When transporting the Space Spider from my home to my office for testing, I realized that the contents of my car cost the same as the car around it. 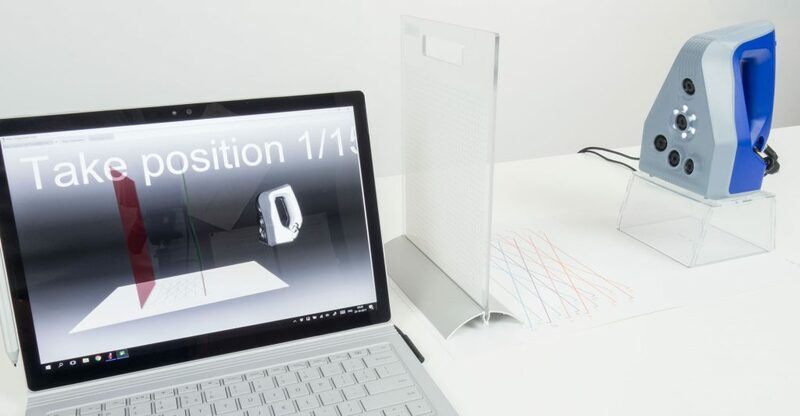 This device is a piece of industrial-grade hardware that’s obviously aimed at businesses where 3D scanning is a serious part of the daily work. And it’s called Space Spider because it also works… well… in space. If you imagine an astronaut 3D scanning a defect in a space station (the scanner was originally developed to meet ISS spec) part to reverse-engineer a fix 20k suddenly seems like a reasonable price tag since his daily transport vehicle is probably a bit pricier than mine. So that’s that. But regardless of your budget a scanner with a price tag like that does set high expectations. Especially in a market where you can get a fixed desktop 3D scanner for a lot less money. I recently reviewed the HP S3 (formerly DAVID SLS-3) which offers similar resolution and accuracy and is available for less than €7000 for the complete kit with two cameras and turntable. But that is quite a large desktop scanner, with many separate parts and cables. It’s hard to aim such a contraption at all the hooks and crannies of a very small object so you will always have to rely on some hole filling. And it also requires recalibration every time the scanner configuration is changed. A handheld scanner solves those issues and offer a lot of flexibility and freedom to the scanning process. The Space Spider isn’t the only handheld scanner offering a 0.1mm resolution: The Creaform Go!SCAN 20 also claims this spec and although Creaform isn’t as upfront about exact pricing as Artec, the product website mentions that their scanners (they also have the Go!SCAN 50 that compares to the Eva resolution-wise) are now “under $20k”. I’m hoping to review those scanners in the future to see how they compare in quality and user experience. Although it has five instead of eight eyes, I totally get the spider resemblance. The eye in the center is the RGB camera, surrounded by LED flash bulbs for capturing textures without the need of a special light setup. The eye in the bottom-right corner is the blue light pattern projector and the other eyes are sensors for that pattern. So other than most structured light scanners that have two 3D cameras, the Space Spider has three at various angles and depths. The result is that this scanner has a resolution of 0.1mm (with an accuracy of 0.05mm) — five times higher than the Eva. Artec also sold a non-space Spider in the past that came in the same beige-and-grey color scheme as the Eva but currently the blue Space Spider is the only option. And it looks great in my opinion. You can get a battery pack for €600 (that’s almost free compared to the base price) that gives you 6 hours of mobile scanning. While I had seen images of the Space Spider before I received it from Artec for this review, I never realized it was so compact. At 190 × 140 × 130 mm is less tall but a bit wider than the Eva. And even though it contains more cameras it has the same light weight of just 0.85 kg (1.9 lb). This means it doesn’t strain your hand when using it for longer periods of time. On the back there’s a single button. It’s actually a switch that can be nudged upwards to start the scanning preview and than again to start scanning, and nudged downwards to stop scanning. There’s a color LED on the button to show different states but I since you’re probably looking at a computer screen while scanning this isn’t very functional. Cable wise it has the same setup as the Eva: a srew-on power cable and a micro-USB cable that’s secured in a hole and under a 90 degree angle so you can’t pull it out accidentally. On the Eva, I found the separate power cable bit cumbersome because the adapter would drag on the floor when walking around subjects but this isn’t much of a problem with the Space Spider if you mainly use it to scan small objects on a desk. And if it does bother you can get a battery pack for €600 (that’s almost free compared to the base price) that gives you 6 hours of mobile scanning. Finally, the scanner has a standard tripod thread. I only tested it handheld but I can imagine situations where a tripod can speed up the scanning of many similar objects. Alternatively, you can also buy the Space Spider combined with a robotic arm and turntable to fully automate small object scanning. I won’t go too deep into the Artec Studio software in this post because I already covered it thoroughly in my Eva Review. 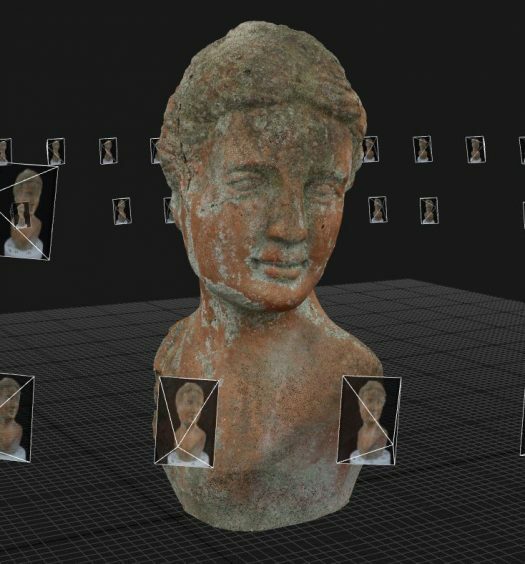 Summarized, this 3D scanning software has been in development for many years and it truly shows. It has all the features and fine control you expect from professional software but also includes the Autopilot mode I raved about in the Eva review. Autopilot really makes using this scanner a piece of cake — easier than the average 2D flatbat scanner! Which is a marvelous achievement considering you’re holding an industrial-grade piece of high-tech equipement. One thing that is noteworthy is that I discovered that while separate scans are usually aligned (almost) correctly after scanning, Autopilot’s align-phase sometimes misaligned them. This happened with quite a few objects and can be frustrating if your workflow relies on the Autopilot feature. For this review, however, I processed most data by running the necessary algorithms manually. That way I could also force the Global Registration algorithm to geometry only instead of geometry & textures, which works fine 90% of the time and saves a lot of time. 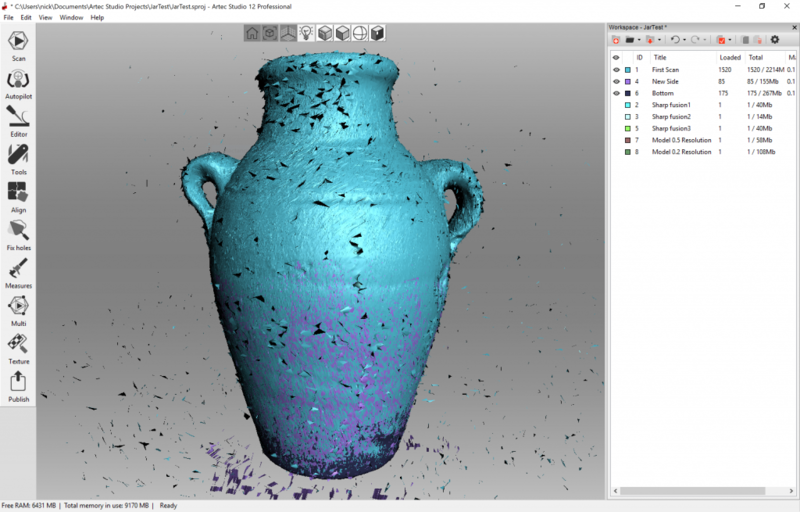 On top of being great at 3D scanning and turning raw point cloud data into nicely fused (and very efficient) polygonal meshes, Artec Studio has many post-production features. And the more I use it, the more I discover how versatile it is. In my Eva review I wrote about the build-in 3D sculpting and smoothing features that makes it easy to correct small geometrical imperfections — either caused by the scanner or actually present on the object — without the need of an external program (or 3D sculpting artist). Autopilot really makes using this scanner a piece of cake — easier than the average 2D flatbat scanner! This time around I discovered that it also has an automatic healing brush for quickly retouching textures, very much like the one in Photoshop. Texturing in general is something Artec has put a lot of effort in, especially compared to other manufacturers that apparently still think textures are just for reference and UV mapping is not something users want. Believe me: they do — I do! And as you’ll see later on in this review, textures from the Space Spider are really good. It might have the same 1.3 megapixel RGB sensor as the Eva but because you’re scanning at a much closer distance you’ll capture a lot more color data. And because color is captured in 24 bits, there’s a lot of headroom for color correction, which the software also does a great job at. My Eva review was done with version 11 of the software and the current version is 12 which includes many workflow improvements. The biggest one is probably the improved Global Registration algorithm which Artec claims can be up to 10 times faster than previous versions, depending on the object. I didn’t do time benchmarks for this review, but I found Artec Studio 12 quite fast considering the amount of data it has to crush with this scanner. Fort this review I used a Microsoft Surface Book with Performance Base equipped with a 2.6Ghz dual-core Intel Core i7 processor (you probably want an i7 processor for the Space Spider) 16GB of RAM (you really need 16GB of RAM or more for the Space Spider — officially 18GB but I had almost no problems) and an 512 SSD drive. It also has a Nvidia GTX 965M graphics processor but as far as I know the Global Registration algorithm isn’t GPU-accelerated (the Texture Mapping algorithm is). Artec Studio Professional costs €400 for a yearly license or €1000 for a lifetime license. While you don’t have to do it often, you’ll have to calibrate the Space Spider once in a while to keep the accuracy within the specifications. I guess you’d normally do this after transportation or before starting a really accuracy-dependent scanning project. Calibration is clearly guided with on-screen visuals (which are presented in real-time 3D, which is awesome, but why is the on-screen text so big?). After using a custom acrylic stand to put the scanner on a special printed piece of cardboard, you’ll simply have to move the calibration board into the indicated locations. Altogether calibration takes about ten minutes. While the Space Spider works similarly to the Eva and uses the same software there are some practical differences. Firstly, the field of view (90 × 70 mm to 180 × 140 mm) and working distance (0.2 – 0.3 m) are a lot smaller. This can make tracking a bit more difficult, especially when the object hasn’t got a lot of surface or color detail (it tracks both). The Eva (which can scan from a distance up to 1 meter) simply sees more of an object at the same time so there’s usually always enough tracking information. The Space Spider also has slightly less than half the frame rate of the Eva (7.5 vs. 16fps) so you have to more it a lot slower for reliable tracking. That said, I used the Space Spider handheld in combination with a simple, $10 manual turntable and had no issues with tracking. Because of the high resolution of the scanner, you’ll sometime notice interference patterns on the surface of your object. In the short but very helpful remote training I got from Artec I was told that these imperfections can easily be fixed by simply re-scanning just the affected area and, align it with the existing scans (which usually needs a bit of manual guidance but works automatically otherwise, see my Eva Review for that procedure), run Global Registration again and then re-fuse the data into a mesh. This worked like a charm! Artefacts caused by lack of scanning data. Fixed after re-scanning just that part. In the end, getting stable tracking with the Space Spider simply requires a bit of practice. When I ran into tracking issues, I would usually just start over and scan the object again using the knowledge I gathered during the first round. This is faster than trying to manually split scans (also covered in my Eva Review) but of course the fact that you can almost always correct failed scans is great if you don’t have access to the object anymore. Features like that make Artec Studio a truly professional tool. Another other unique aspect of the Space Spider is that is uses blue LED light source instead of white light bulb. This has multiple technical advantages but for most people the biggest advantage is that it’s less sensitive to interference from other light sources and can more easily scan dark objects. I was really impressed by the fact that I can scan a black camera (that even has a glossy black viewfinder) without any problems in a studio with all lights on — and close to a window on a relatively sunny day (those are always relative in the Netherlands). The blue light is also a lot easier on the eyes and if you don’t need color (tracking) you can also turn of the white LEDs around the RGB camera. All scans below are done in a normal office environment with both artificial light and light coming through windows. I did all scans with Real Time Fusion (RTF, see Eva review for more info on that) turned on but just because I like that mode for better seeing my progress. That worked well for all small models but with the 40 cm tall bust RTF started to hit the limits of my GPU with just 2GB VRAM. All the results you see are post-processed raw scans using the Sharp Fusion algorithm (there’s also Smooth Fusion but I’m guessing if you spend 20k for capturing fine detail, you really want the fine details to be present). Depending on the complexity of the object, I usually ran it through Mesh Simplification, which does a great job at lowering the polycount while preserving most details. All textures are 4K UV maps. You can also choose 8K (16K is only available on GPUs with a lot of VRAM) but in for online visualization like this blog 4K is more than enough for these small objects. Let’s start with comparing a scan from the Space Spider (first) with the same object scanned with the Eva (second) to get a good idea of the difference in resolution. Since this object isn’t great for judging textures, let’s switch both embeds above to MatCap render mode by using the gear icon in the bottom-right corner — or by simply pressing the 3 key on your keyboard when the embed is selected — to see just the geometry. The difference is immediately clear (do ignore the noise on top of the Eva scan, that’s simply my fault). I won’t mention polycounts too much in this review, because Artec Studio is very good optimizing meshes but for this example the Eva scan is 622 thousand polys vs. 3 million on the Space Spider scan. The result is truly impressive: you can literally see every detail on this sneaker, from the holes in the side to the stitches and the subtle pattern on the front of the sole. Before I show you the small objects that the Space Spider is intended for, I’ve made a scan of something at the larger end of the scale for a scanner like this. The bust below is 40 cm tall and took a while to completely scan so the scanner captured a lot of data. It also pushed Real Time Fusion beyond the limits of my GPU. Although I could run the Global Registration and Sharp Fusion (at 0.2 resolution) this was the only scan I wasn’t able texture successfully (it just processed forever) on my laptop with 16GB RAM and 2GB VRAM. So below is a textured version at of the bust fused at 0.5mm resolution followed by an untextured version at 0.2mm resolution (warning: that’s quite a big file to load). It’s good to know that even at the relatively “low” resolution of 0.5mm, the scan from the Space Spider has a lot more geometric detail than the same bust scanned with the Eva (third model, which is somehow mirrored). For many purposes, that model is more than enough. And it’s also noteworthy that Sharp Fusion at 0.5mm resolution is a great lot faster than at 0.2mm. The second model is, as you can clearly, see detailed on a crazy high level. I was actually surprised that my Surface Book could fuse it at 0.2mm resolution (took a while, of course). For comparison, that scan contains way more details than I ever got with Photogrammetry software like Agisoft PhotoScan (Review / example model) – and it’s size-accurate to an incredibly precise level. That scan contains way more details than I ever got with Photogrammetry software – and it’s size-accurate. 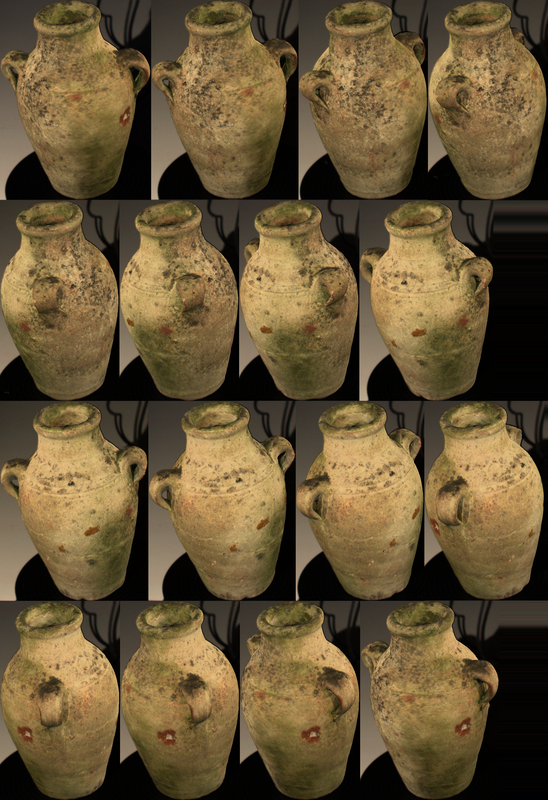 For a more realistic comparison – between two structured light scanners – let’s compare a scan of my Old Jar from the Space Spider (first) with a scan made with the HP/DAVID SLS-3 (second) which is a static, tripod-mounted structured light scanner. When comparing the textures, it’s clear that Artec is doing a better job than HP. The Space Spider’s textures are very good and sharp, while those from the S3/SLS-3 look blurry. It’s also good to note that the former is a efficient 4K UV texture while the lather is just made up of a series of photos. You can click the images below to enlarge them. Switching the embeds to MatCap mode reveals that both scanners are capable of capturing a lot of geometric detail. The Space Spider scan is a bit more pronounced for this example but I’m not going to claim which scanner captures the most details because both come with software that allows you to set fusion resolutions. And for scanners with resolutions in the 0.5mm range there are many environmental and human factors weighing in on the end result. But while both scans contain an impressive amount of geometric detail, the HP 3D Scan Pro 5 software exported an OBJ with a whopping 13.5 million polygons while the Artec Studio Professional 12 software could do with just 1.4 million polygons for this object — ten times more efficient! Both scans are great and very similar. The scanners captured good, usable textures and a level of geometric detail at stitch level, something I haven’t seen on any other scanner I’ve tested so far! But the SLS-3 didn’t capture the black stripes on the shoe in a dimly lit room, while the Space Spider captured them perfectly next to a window. And while I scanned multiple cycles with the SLS-3 it was hard to capture the inside of the sneaker because of the distance between the cameras. With the small Space Spider I could interactively move over the shoe at many angles to capture almost the entire inside of the sneaker. This also results in more actual geometry in the laces area where the SLS-3 had to rely on hole filling. Next up is a vintage Agfa Clack camera from my personal collection. An object that can be considered hard-to-scan, because it’s black and even has glossy black and chrome parts. I’ve never been able to scan this camera with any of the Desktop 3D Scanners I reviewed but the Space Spider had no problems with it — at all! And again, this was in a normally lit office with windows. I didn’t even increase the scanner’s sensitivity. The only other way I was able to capture this object was through Photogrammetry so below is the result from the Space Spider (first) and one captured with a Canon DSLR in combination with the Agisoft Photoscan (Review) software. Photogrammetry is known for its very good textures and the Photoscan example above is no exception. But in this case it also proves how good the textures from the Space Spider are, especially if you consider that it only has a 1.3 megapixel RGB camera and a tiny lens while the Canon DSLR I used for the Photoscan capture has 18 megapixels. And that capture was also made with a complete studio light setup with softboxes while the Space Spider scan was done simply on my desk — in a lot less time. Switching to MatCap mode you can see that both models have very detailed geometry but that the Photogrammetry version suffered from DSLR camera noise and algorithms problems in the glossy parts like the viewfinder. The Space Spider scan is a lot cleaner and would require a lot less editing to be turned into a professional 3D asset. 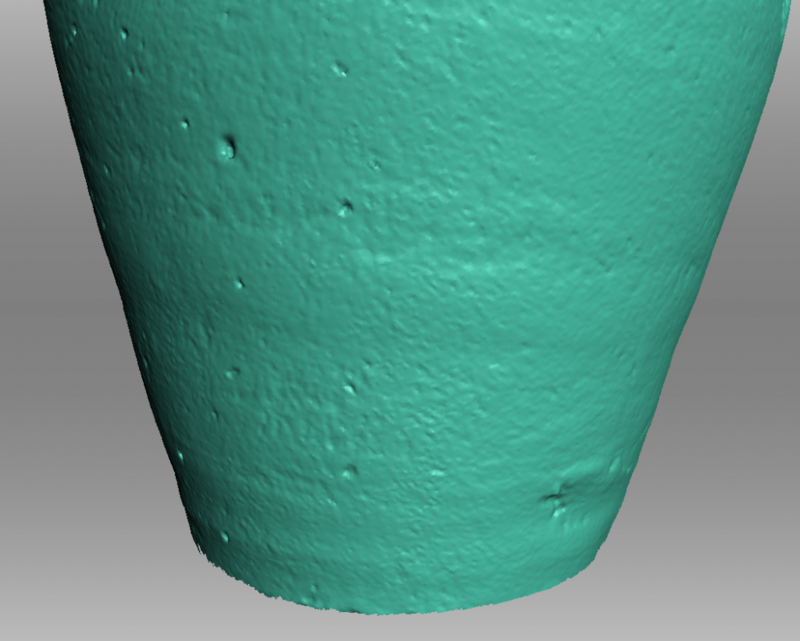 The objects above are all richly textures so they’re pretty easy to track for an active 3D scanner. Next up is a scan of my Surface Mouse, which is symmetric, smooth almost has no visual or geometric details. 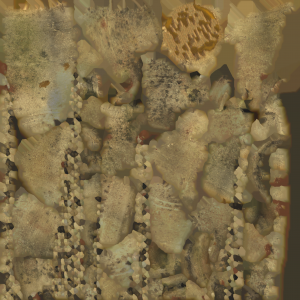 So I made a scan of the top and bottom with the mouse laying on a book cover which rich details. Then I aligned the scans and fused the result. Below is the same mouse scanned with the Space Spider (first) and EinScanPro+ (Review) in Fixed Mode (meaning on a tripod with turntable — not handheld!). I’ve disabled the textures since this mouse is grey anyway. As you can see the both scans are very nice detailed. The Fixed EinScan-Pro+ is a bit smoother but the Space Spider scan was fused at 0.1mm resolution (you should only do this when the Max. error of the raw scan data is 0.1 or lower after Global Registration, which was the case here). It has a bit more noise because of the higher resolution but also shows a lot more details on and around the scroll wheel. I could also more easily align the handheld Artec scanner with the ridge on the side so that area has more actual details instead of fills. Onto something even smaller, namely a 7cm tall plastic toy. This scan really shows how good the Space Spider is at capturing reality. The texture is great and the geometry is great. It even captured the flower-shaped button which is made from translucent plastic, something every other scanner I tested had problems with. It’s simply a scan I can’t really say anything bad about. 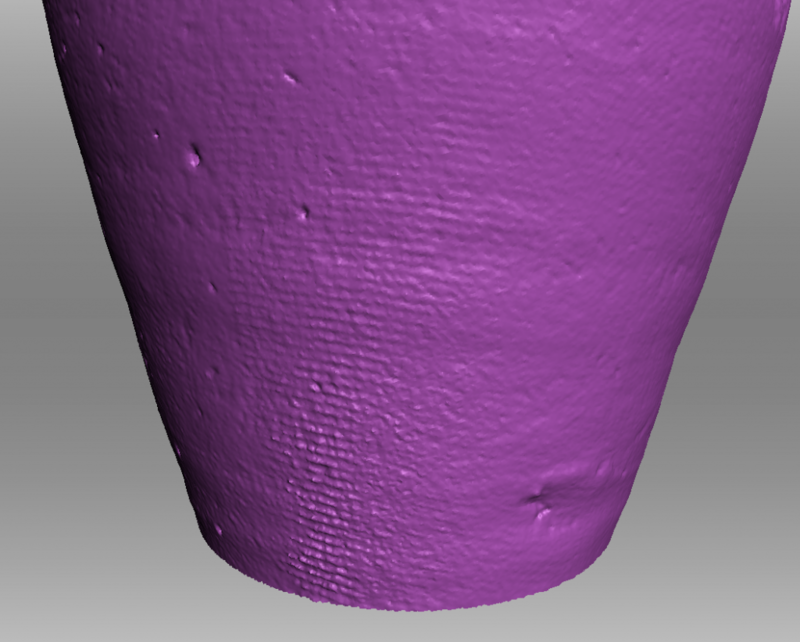 That texture looks really good and is correctly mapped onto the cylindrical surface. Yes there are a few reflections here and there but it’s a semi-glossy can and this can be fixed easily. And the scanner had no problem at all with scanning the aluminum top and bottom, and correctly aligning the two scans I made. The geometric details in the lid are simply something you will not get from a more affordable handheld scanner. The following scan is not pretty but it’s possibly the most impressive one in this post. It’s a key, which I scanned without any treatment with white spray or anything. Just a chrome, shiny, tiny key, scanned handheld in a lit room, near a window — light everywhere! I deliberately didn’t smooth the scan so it’s quite noisy but I’m really impressed by how every detail of the key is present. I’m confident that this 3D model can be used to 3D print a copy of this key (so I won’t tell what lock it belongs too!). Of course if you spray objects white you will get a smoother, more detailed result (keep in mind that this scanner will pick up spray texture and drips, too) but for me this was kind of the ultimate test — and it worked. Finally, I wanted to test the Space Spider on people. It’s not meant for full body scanning or even busts but I’ve seen example cases where an Eva was used to scan a person and then the Space Spider was used to capture just the facial details to create high quality game or VFX assets. Below is my face scanned with the Artec Eva and Space Spider. While the first one is already very good and leaps ahead of what you can achieve with a Depth Sensor (like the Structure Sensor or 3D Systems Sense 2 / RealSense SR300) the Space Spider scan is incredible! Again, the texture is better because it’s compiled out of much more 1.3 megapixel photos and the geometry is a lot more detailed. Without being scientific, I’d say the five times higher resolution simply makes this scan five times better! It’s probably possible to scan a full head with the Space Spider (if you have a monster PC) but then it’s a good idea to wear a bald cap. As you can see on my beard the algorithms have a hard time solving hair data. I also made a scan of the face of my business partner Patrick and ended up using the Real Time Fusion version of the scan because it rendered his beard in a more pleasing way than the Sharp Fusion algorithm. The fact that the Space Spider can capture the holes of pupils is really awesome (and kind of scary). If you plan to invest in something that cost almost €20k you want to know if it’s good. Maybe that’s why you’re reading this post, or maybe you’re just licking your fingers when looking at the example scans. Either way I can say that the Space Spider really delivers on its promise. With the Space Spider you can make scans with a level of detail that you normally get from high-end, tripod-mounted scanners but with the added flexibility of a handheld scanner. And if you add the battery pack you can scan wherever you want. That amount of freedom offers a whole new level of freedom to small-object and small-part scanning. With the Space Spider you can make scans with a level of detail that you normally get from high-end, tripod-mounted scanners but with the added flexibility of a handheld scanner. The hardware itself is surprisingly small and light-weight so it’s easy to handle. It only has one button and comes with software that has a lot of features but is relatively easy to use. The Autopilot feature helps beginners to make successful scan quickly, although I did get some alignment issues when using that with the Space Spider. Need Unbiased 3D Scanning Advice for your Specific Purpose? If you want to know which scanner would fit best into your workflow or if you’re in doubt between different brands and models, I’m happy to help you out. I have hands-on experience with all scanner I’ve reviewed on this website (and more!) and a vast library of example scans. And since I don’t sell any hardware or software my opinion is unbiased. Scanning can be done practically anywhere and doesn’t seem to be affected by either indoors or outdoors light. Tracking is really good but might require some practice because of the small field of view of the scanner. The Space Spider makes scans that contain an insane amount of geometric detail and the Artec Studio 12 software can produce surprisingly light, efficient meshes. And although the scanner has an 1.3 megapixel RGB camera it captures so much close-up photos that it can compile impressively detailed and efficiently laid-out UV texture maps. Keep in mind that you’ll need a high end computer to get the most out of the scan data. For small objects, a high-end laptop with a modern processor, 16GB RAM and 2GB VRAM works well but if you want to experiment with larger objects (30+ cm, like the bust in this post) you might need something more powerful to get the most out of the scan data. Of course, a scanner in this price range is an investment to take seriously for every business. That’s why it’s good to know that Artec has trained resellers around the world that will be happy to give you a demo if you’re interested. Update: After publishing I replaced the Surface Mouse scan with a better one because I didn’t fuse the original one at the highest 0.1mm resolution while the scan data allowed for it. If you think this post is valuable to your friends and followers, I’d really appreciate it if you shared it on your favorite social network using the buttons on the left side (desktop) or top (mobile) of this post. And if you to receive updates, follow me on Instagram, Twitter, Facebook or LinkedIn. Although the scanner has a 1.3-megapixel RGB camera it captures so many close-up photos that it can compile impressively detailed and efficiently laid-out UV texture maps. so interesting Thing an Aggregate of a commercial grade hand-held scanner And RGB camera it captures so many near-up snapshots that it could collect impressively exact and successfully laid-out UV texture maps.